I love any book that makes me want to learn more. The Weiser Field Guide to Witches is a surprisingly compact publication, given the breadth of material included by author Judika Illes. While it is by far not an all-encompassing work, The Weiser Field Guide to Witches touches on an impressive array of topics related to modern-day witchcraft, including brief definitions of many of the paths that fall under the blanket term of witchcraft; biographical sketches of many of the men and women that have made contributions to and continue to influence the development and advancement of modern witchcraft practice, as well as profiles of several deities and mythological witches found in the lore from cultures around the world—–and more! I picked up this book and read it cover to cover, which may or may not have been the intended way to process it, but I’m so glad I did it that way. If I had tried to tackle The Weiser Field Guide to Witches any other way, I’d probably have missed something. I found each chapter had that perfect balance of the familiar and the exotic and each profile provided enough information to educate, but not lecture. In many instances, particularly with respect to profiles of historical figures and figures in the less familiar mythologies, I was left wanting to know more. The Guide became a springboard for further exploration and reignited the curiosity that led me to the Craft over a decade ago. The Weiser Field Guide to Witches is a fun, educational and insightful resource, perfect for the seasoned practitioner, the novice or even the simply witch-curious. It is a welcomed addition to my personal library and has earned its place on my bookshelf, next to Ms. Illes’ Element Encyclopedia of Witchcraft. Pagan Pages: What inspired you to put together this particular compilation? 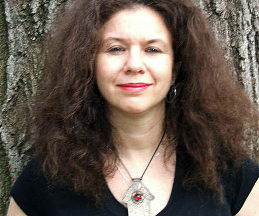 Judika Illes: In the particular case of The Weiser Field Guide to Witches, invitation preceded inspiration. The Weiser Field Guide to Witches is the fifth book in a series of field guides published by Weiser dedicated to mystical and metaphysical topics. The earlier books in the series are devoted to ghosts, vampires, cryptozoology, and ascension. A sixth Weiser Field Guide dedicated to the paranormal has since also been published. It’s a really clever concept—field guides to witches and vampires as opposed to sea gulls and mushrooms– and I wish I had thought of it but credit must go to Weiser. 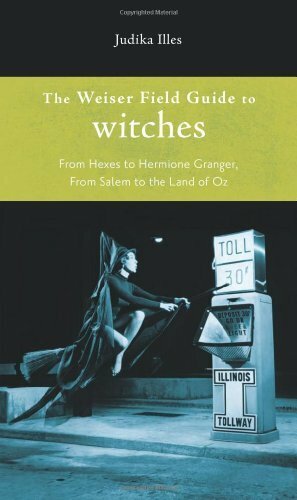 When Weiser asked whether I would be interested in authoring the field guide dedicated to witches, I absolutely jumped at the chance. I feel very lucky, honored, and blessed to have received this opportunity to further explore one of my favorite topics. PP: What was the criterion for creating this guide? J I: The field guide is like a mini-encyclopedia. So there must be a balance between subjects of such significance that they must be included and those that add spice and keep the book interesting for those already well-versed in the subject. It has to serve both novices and witch-aficionados simultaneously so a lot of thought went into who actually made it into the guide. You really can’t call something a “field guide to witches” and not include such important and significant historic figures as Mother Shipton, Gerald Gardner, Aleister Crowley, Sybil Leek, and Marie Laveau as well as culturally influential fictional characters like Harry Potter, Hermione Granger, the Wicked Witch of the West, and Bewitched’s Samantha and Endora. Then I was able to add to the mix those people that I would consider the too-often-unsung heroes and heroines of witchcraft: people like Veronica Franco, Paschal Beverley Randolph, Mary Ellen Pleasant, and Doreen Valiente. I wrote a substantially larger book several years ago, The Element Encyclopedia of Witchcraft (HarperCollins, 2005). Even though I seem to specialize in really big books, still every book has a finite number of pages and inevitably I have regrets about who or what couldn’t be included. The Weiser Field Guide to Witches gave me the opportunity to fill in some of the blanks I felt were left in the earlier book. Thus, there are entries for Robert Cochrane, Laurie Cabot, and Libuse, the witch who is credited with founding the city of Prague. PP: Are any of the people/deities/personas particularly influential on your path and how so? J I: Many of them. Sybil Leek, Helena Blavatsky, Agrippa, and Franz Bardon have served as role models and inspiration for me. Many of the divine witches—deities whose myths explicitly identify them as witches—are incredibly significant to me personally, among the spirits closest to my heart: Lilith, Freya, Isis, Oshun, Yemaya, and Kybele as well as Odin, Ogun, and Simbi. I was raised on Baba Yaga stories from my earliest childhood—I’m always happy for the opportunity to present her in the context of her sacred origins, rather than as just a fairy-tale monster. I know how important Hekate and Diana are for many people—there are entries for them in The Weiser Field Guide to Witches, too. Many of my favorite animals are closely identified with witches: cats, wolves, owls, and crows, to name a few—there are entries for them, too. But honestly, any discussion of witches is very personal to me. PP: Were there any particular favorites featured in the pop-culture section of the guide? J I: Oh yeah, again, many of them! My favorite movie witch is the one played by Veronica Lake in I Married a Witch—I like my witches unrepentant— a lot of people are unfamiliar with that old film and so I’m happy to have this opportunity to introduce her. I’m a huge sequential art fan: comics, manga, anime, cartoons—that’s a genre that’s packed with witches and magical practitioners. My own personal favorites include the Scarlet Witch, Zatanna, Madame Xanadu, Magik, and Doctor Orpheus. But I think my affection for many of my subjects- whether divine, fictional, or historic- shows in the writing. I am very blessed to be able to write about what I love. PP: How has the portrayal of witches/wizards affected paganism on the whole, in your view? J I: There is often an assumption that Paganism is necessarily witch-friendly but historically this has not always been the case: Pagan Rome was certainly not a witch-friendly society. For over two thousand years—and longer!—witches or people identified as witches have been, with very few exceptions, almost incessantly portrayed as evil, selfish, and destructive. This can’t help but influence how different individuals perceive witches—many people, regardless of spiritual background, possess a lot of fear and ambivalence. Spell-casters, by whatever name you call them but who are, in essence, the wise people who are aware of Earth’s subtle forces, have been so denigrated and diabolized that it’s no wonder that so many people in our society, whether Pagan or otherwise, still possess a negative or ambivalent perception of them. There is a discussion of the character Bellatrix LeStrange in The Weiser Field Guide to Witches—even a book and film series as witch-and-wizard friendly as Harry Potter still features a wicked witch. You asked previously about the criteria used to choose entries for The Weiser Field Guide to Witches: inevitably a book devoted to witches has to address the many people who have historically been killed or persecuted because they were perceived as witches—and who continue to be persecuted in many parts of the world today.